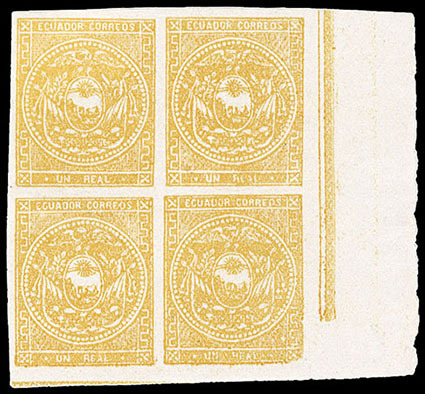 Ecuador, 1865, 1r Yellow, group of three mint multiples in shades; includes a bottom right corner margin block of four in the yellow shade (positions 80-81/89-90), block of 4 (positions 70-71/70-80) and a horizontal pair in the yellow buff shade, o.g., corner margin block without gum, full margins, Very Fine. 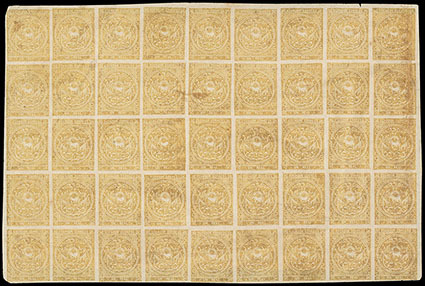 Ecuador, 1865, 1r Yellow Ochre, top half sheet of 45 (positions 1-9 // 37-45), full brownish o.g., margins wide to close at corners, margin crease between 4th and 5th vertical rows and flaws including tear at bottom affecting position 42 and small repaired corner tear, otherwise Very Fine, a very scarce half sheet. 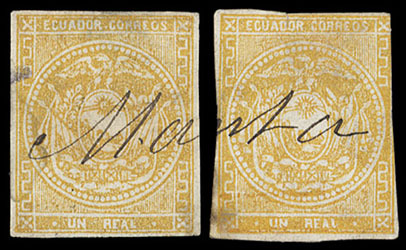 Ecuador, 1865, 1r Yellow Buff, complete sheet of 90, likely from the 1871 printing, showing full ruled lines in sheet selvage which are doubled at right, constant prominent flaws include position 66 with colorless line in bottom right spandrel, position 71 with colorless line through "REAL" and positions 83 & 90 with lower right corner damaged, full o.g., some gum wrinkling and minor selvage flaws, F.-V.F. Scott No. 4 Estimate $3,000 - 4,000. ONE OF LESS THAN FIVE COMPLETE SHEETS RECORDED OF THE 1 REAL YELLOW ISSUE. Ecuador, 1865, 1r Yellow Buff, 2 singles, manuscript "Manta" cancel of Manabí Province, one stamp with thin at top, otherwise Very Fine, only four stamps and no covers are known from Manta, ex-Olgieser. Manta was a small town and no handstamp are known to have been used there from the period of the first issue. 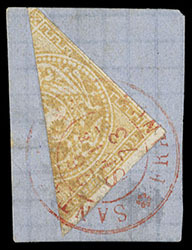 Ecuador, 1865, 1r Yellow Buff, Diagonal Bisect, upper left portion of stamp tied on piece by red "Santa Helena, Franca, 26 Set, 73" cds of El Guayas Province, Very Fine, this being the only known example of this cancellation. Scott No. 4c Estimate $200 - 300. Ecuador, 1865, 1r Yellow Buff, vertical pair, complete strike of the Pelileo fancy star cancel of Tungurahua Province, full margins, Very Fine and choice. 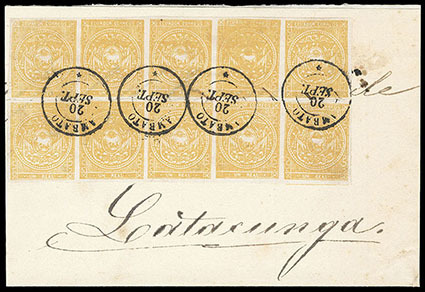 Ecuador, 1865, 1r Yellow Buff, block of 10 (positions 1-5 / 10-14 with position 4 double frameline at bottom), on piece canceled by bold Ambato circular town date stamp cancel, ample to large margins, some horizontal separation cuts similar to that of hand-rouletting, Very Fine. 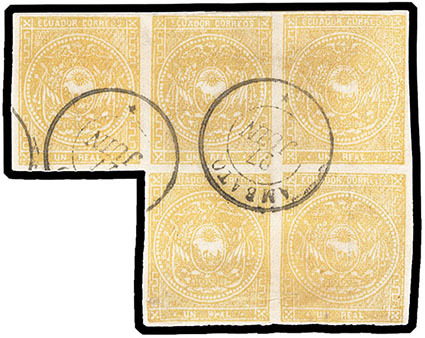 Ecuador, 1865, 1r Yellow Buff, 3 used blocks; includes block of four (positions 69-70/78-79) and irregular block of five (positions 61-63/71-72, position 71 colorless line through "REAL") both with Ambato cds's, block of six (positions 41-43/50-52, position 43 with part of double frameline at top) with Guayaquil cds's and dotted lozenge handstamps, irregular block of five on quadrille paper, block of six with diagonal crease, otherwise Very Fine. Scott No. 4, 1 Estimate $500 - 750. 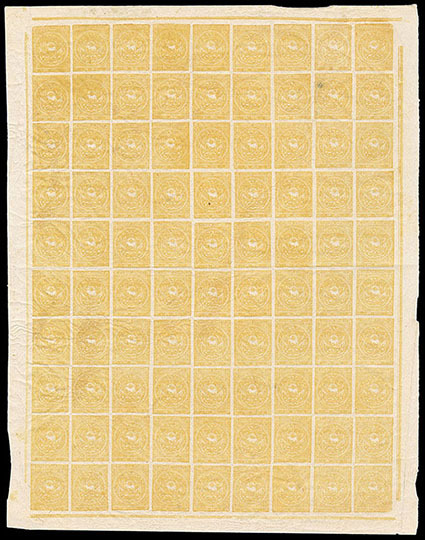 Ecuador, 1865, 1r Dull Orange Yellow, circa 1871-72 period printing, block of 20 made up of two complete vertical rows in sheet (positions 4-5//85-86), prominent flaws including position 14 with "BEAL" for "REAL" and position 86 with frameline broken at lower right corner, margins clear to in at upper right, deep color, internal split and tear affecting stamps in rows 7 & 8 and small tear at right side of row 8, F.-V.F. appearance, ex-Lund; with 2013 Moorhouse certificate. 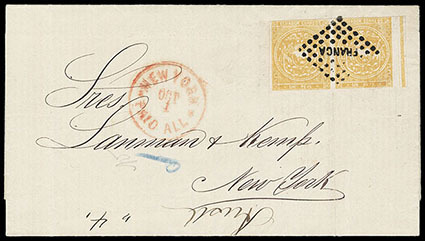 THE SECOND LARGEST USED MULTIPLE OF THE 1 REAL YELLOW ISSUE OFF COVER.